For Swiss-born engineer Hans Camenzind, the 1960s were a mixed bag. He came to the United States at the beginning of the decade and earned his Master’s from Northeastern University. In those days, the ring of communities around Boston was becoming a mecca for technology, and Hans wanted in on the action. But with a wife at home and kids on the way, one does what one must, and he landed a job with the P.R. Mallory Corporation, a Massachusetts company primarily in the dry cell business. Mallory wasn’t exactly a cutting-edge tech firm, but Hans stuck with it for six years, hoping that the staid company would break into something more exciting than batteries. It didn’t, and Hans started bombarding tech companies from coast to coast with resumes. In 1968, he signed on with Signetics, a young Silicon Valley company started by former Fairchild engineers who bristled at their company’s focus on discrete components and believed that integrated circuits were going to be the wave of the future. Finally, here was something that Hans could sink his teeth into. Sadly, it was not to last. Signetics had struggled right from the start, trying to build its business around custom ICs built to customer specifications. The company eventually found success in the defense market, but by the time Hans joined up, competition from other, larger manufacturers, ironically including Fairchild, had put the company on the ropes financially. That coupled with the downturn in the US economy as the 1970s rolled around led to round after round of layoffs at Signetics. Within two years, Hans saw half of his Signetics colleagues disappear. Knowing how the story would end, Hans took a leap of faith. He resigned from Signetics, but not before convincing his management to hire him right back as a consultant. The company desperately needed a win, so they gave him a one-year contract to come up with something new. Hans was working at a fraction of his former salary, but he was doing what he loved, and more importantly, he was working when others weren’t. In the summer of 1970, working out of rented space in Sunnyvale wedged between two Chinese restaurants, Hans got to work. When he struck out on his own, Hans already had the basic idea for a timer chip in mind. His inspiration came from his technical education in Switzerland, which included a stint as a radio repairman, or “radio mechanic” as the Swiss called it. So he knew all about radio design, and during his time at Mallory he had pondered if it would be possible to build a radio on a chip. He knew that traditional designs using large coils wouldn’t work in silicon, so he looked for alternatives. 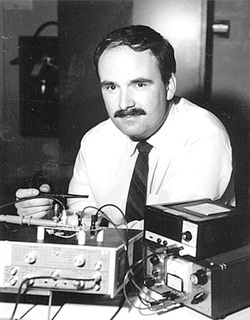 Scouring the MIT library at night, Hans discovered papers describing phase-locked loops, or PLLs, and he realized they would be perfect for the tuned circuits needed to build a radio receiver IC. When he jumped ship for Signetics, he convinced his new management that a PLL chip could be a winner. They agreed, and Hans went on to design the 565 PLL chip, a successful product in its own right, which came to market just before Hans left. One of the main parts of the PLL that Hans designed was an oscillator whose frequency could be controlled by external components. It struck Hans that this could be easily modified into a timer circuit, one that could be used in either a free-running or one-shot mode, depending on how the external components were wired. He thought such a timer would be a handy component all by itself, and pitched it to Signetics as his contract project. They balked at first, fearing a timer would cannibalize sales of other Signetics chips, but they eventually approved the idea. Hans spent the first six months of his contract breadboarding his circuit and optimizing the design. It worked, but it had one major problem: the chip would require nine pins, which would force it to be packaged in a 14-pin DIP rather than the much cheaper and more compact 8-pin part. Unhappy with the compromise but pressed for time, he submitted his design for review and got to work on laying out the lithography for the chip. The problem wouldn’t leave him, though, and two weeks into the tedious sessions spent over a light table manually cutting out circuit elements from lithography film with a knife, he realized that he made a mistake. He could eliminate the need for the ninth pin by removing the voltage-to-current converter circuit and charging or discharging the external capacitor directly. The change meant losing two weeks of layout work, but the advantages of the improved circuit were too good to pass up. Layout of the chip, an entirely manual process in 1971, took almost the rest of his one-year contract. Hans beat the clock, though, despite some eleventh-hour chicanery from a former Signetics employee who went to another company that came out with their own timer chip that was eerily similar to the circuit Hans had presented in the original design review. That product was withdrawn from the market when Signetics released their chip, dubbed the “555” just because marketing-honcho Art Fury liked the way it sounded. 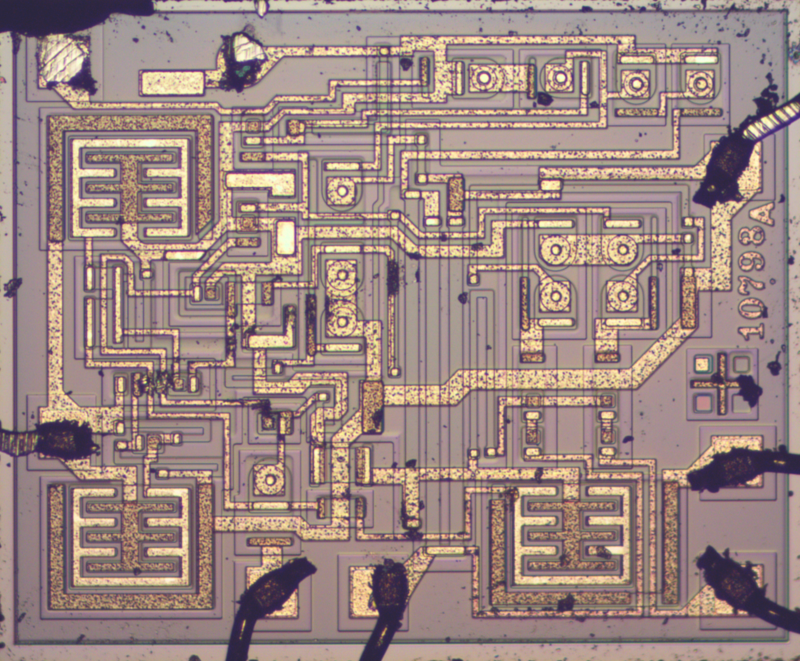 The new chip had a grand total of 23 transistors, 16 resistors, and two diodes on board, and was packaged in either an 8-pin DIP or a TO-5 metal can with eight leads. When it came out in 1972, it sold for a mere $0.75 and was an instant hit. Engineers fell in love with the chip because of its simplicity and flexibility. It could do just about anything, and Hans was constantly surprised by the applications designers thought up for it. He had seen it as timer that could be used as an oscillator, but couldn’t foresee all the uses for it. The 555 has found its way into hundreds of products from kitchen appliances to toys to game consoles and PCs, and it has even made it into space on satellites. Over a billion of the chips were produced between 1972 and 2003, and the design has remained the same in all that time. The 555 was joined by the 556 with two independent timers in one package, and later the 558 quad timer. A CMOS version was also released, and the chip is still in production to this day. The 555 has endured not because it’s a solid design; by Camenzind’s own admission, it’s far from perfect. What made it a classic is that was purposely made as flexible as possible. Creativity favors open-ended designs that can be a sandbox for development, and the 555 has been delivering that for over half a century now with no sign of slowing down. That it came from a leap of faith intended to keep food on the family table only makes it more endearing. A rather common thing in business. Many a time we’ve heard “throw away the prototype”. The 555 is pretty great, and it’s large output current makes it useful for driving MOSFETs and such, but I’ve always found it unfortunate that the discharge pin is basically an open-collector copy of the output pin; it would have been even more useful if it had been the inverse of the output. Instead of discharging the capacitor via the pin, with a resistor charging the capacitor as usual in 555 timer circuits, it could have been a resistor from the output to the capacitor. 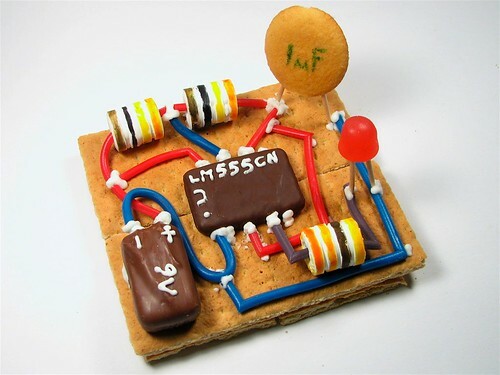 Have you breadboarded this? There’s always room for improvement! > it could have been a resistor from the output to the capacitor. And when your loads vary, changing the output voltage, they would also mess with your frequency. Hey, a load-to-frequency converter; isnt’t that neat? About IC dies: i would like to find some (beautiful) pictures / X-Ray pictures of (beautiful) IC dies, but unfortunately it´s not that easy to find on a search engine, has anybody tips or links ? Well, ok, too complicated and colorful. No processor, memories, and generally no digital chips. Nope, but this one is gorgeous ! Fans of bare dies, stay tuned! We’ve got a video with Ken Shirriff coming out later today, specifically talking about the 555. Dunno if this fits the bill, but electronupdate posts up die shots of IC’s he’s de-encapsulated. Really nice! thanks for the link. I still wonder how I could have find it with a search engine… “IC” or “DIE” or “electronic circuit” are too generic terms to be useful ! Too bad it can’t be made out of chocolate too… Oh wait…. The biggest problem with a 555 is not the chip itself, but the capacitor one uses to time it. Another thing: it could use a higher input impedance on the RC timing circuit. It could also use some current limiting for the output transistor (All who have let the magic smoke out of a 555 by running the output in to a dead short raise your hands). I can go on like this. It’s not a magically good chip. But it’s good enough and simple enough to do 90 percent of what people need a chip like this for. Another quirk: it can’t do a perfect 50% duty cycle. The best workaround is to double the target clock speed and put a flip-flop circuit on the output to get 50% duty cycle. I don’t see why it can’t do it. The 555 is two comparators wired to a flip-flop. There’s nothing preventing you from building a perfect 50/50 circuit around it. sorry, latch, not flip flop. There was a solution early on, I think I first saw it in one if those reader supplied columns in “Electronics”. Feed the output via a resistor to a capacitor to ground on pins 6 and 2 tied together. That gets close enough, and makes for the simplest multivibrator using a 555 even without the better waveform. A pullup resistor from output to the power supply fixes the imbalance. The CMOS 555 apparently is fine without the pullup resistor. You can actually use the output pin to charge/discharge the capacitor for 50% duty cycle (and leave pin 7 unconnected). This also save 1 resistor. The problem is that the output load can affect the oscillator. The VOH/VOL has quite a large drop as you increase the output sink/source current. Rail to rail output would be nice, so it could be paired with complementary logic easily. E.g. drive a half-bridge directly. Try to find anything that really drives its output rail to rail. e.g. the old TI TPS281x dual 2A MOSFET driver series have parallel bipolar and CMOS output drivers that are designed to do just that. And yet, feeding into pins 2 and 6, one ends up with an inverter that can supply a bit of current, and in the early days a 555 was handier than a driver IC. Hans Camenzind made a new improved design as the ZSCT1555 but it wasn’t popular. The micropower CSS555 is ideal for long life battery powered timing applications. You won’t find any in my lab. Never found a use for ’em. Mostly I find their use kludgey. And I’m sure the shipping charges to Mars is part of the reason for their scarcity. On the other hand, in a Martian lab, there may be a dozen Illudium Q-38 Explosive Space Modulators! Yep. I think I used a 555 once on a professional design. 99% of the time I fired up one of those things I was just playing. This is HACK a day not WORK a day. You are supposed to be playing here! This is a real good point, thank you. Maybe it’s just because I like working with software better than hardware, but I would usually rather hook up a cheap microprocessor like an ATTiny instead of a 555, even if I’m just blinking an LED. You can fully emulate anything a 555 can do with a microprocessor. You can also do things that a 555 can’t, and you can change the behavior without making any changes to the PCB. Now, I’ll grant that the 555 is considerably cheaper in quantity than a microprocessor, and if you’re making a million of something that can be substantial. But all of my projects are quantity less than ten. 50 cents vs 5 cents isn’t a big deal on that scale. Heresy, hardware is where the fun is. Check it out, I made a blinky light using nothing but a GTX 1080TI! Can a microcontroller handle the supply voltage, output drive current and analog input voltages that the 555 does? I hear ya… but 555’s don’t have to be programmed in production. I just took a quick look through my 1976-vintage databooks, and couldn’t find the ATTiny (or any other cheap microprocessor) anywhere. Remember, it takes 25 microseconds for a typical attiny MCU to do ADC conversion and then you have to process the input and covert it to an output, which means your bandwidth cannot be higher than about 20 kHz. A 555 works reasonably well to 2 MHz. 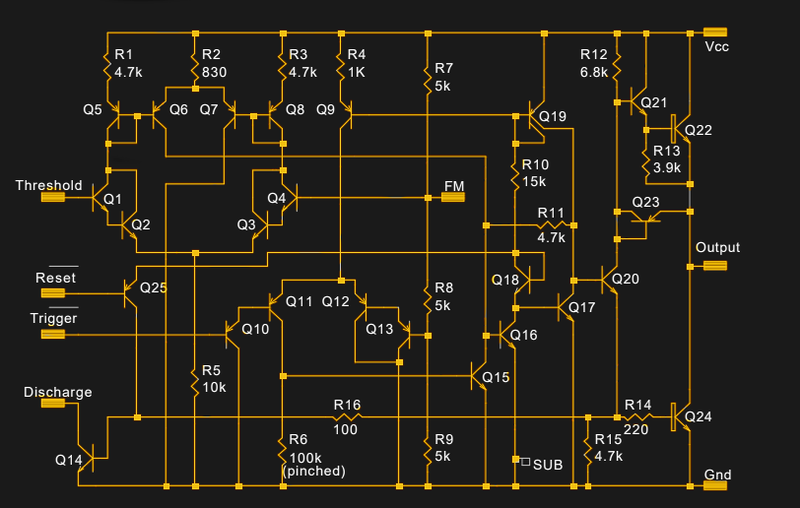 >A 555 works reasonably well to 2 MHz. Atmel 8-bit uP have really poor ADC implementations. ARM Cortex ADC are usually 12-bit and around 1us conversion rate. Some can drop the ADC resolution to 8-bit and run faster. Even the lowest end STM32F0 can automatically compare the ADC values against user programmable lower and upper threshold in hardware and cause an IRQ when either threshold are crossed. Emulating the NE555 at 100kHz is easy. “Mostly I find their use kludgey.” Most of what I do is kludgey! Still, I’ll use a microcontroller or a spare inverter gate (with hysteresis) nearly every time. Ironically, the 555 is too special-purpose to warrant the space on my shelf. If I want a timer, I grab an attiny in a DIP-8 package. It’s about time someone wrote a 555 article! There’s always time for a 555! Forget Jenny, for a real good time just call 555! I’d write more but my 555 says times up. :-( If only I had a 556 I could get a second opinion about that. OK, how many 555 does it take to auto-dial 867-5309 on a touch-tone phone system? Bonus points for a circuit with a pulse-dialing option. There is nothing that reminds me of my fun days as a wide eyed experimenter in junior high than the NE555, LM3909 and the wonder of Mims’ Engineer’s Notebook. Whatever happened to the popularity of the Raspberry Pi as a replacement for the SE/NE 555? Nuts and Volts is curently running, or maybe they just finished a multi-issue series on replacing the 555 with a Pic! The code might end up being a lot more complicated than anticipated to build a timer on top of a full-featured operating system. But any sort of microcontroller can do a good job here. Bare AT-TINY85, micronucleous, arduino, sino:bit, whatever. Why is 555 still recommended to beginner hobbyists? It’s a great IC and all, but it’s just horribly outdated at this point. It’s a retro item. Our current tech is only great because it is standing on the shoulders of retro tech. If you just go straight to doing everything on an SOC running linux, you’re leaving huge gaps in your understanding and really missing out.. Beginners should start at the beginning, or else they will likely never learn the fundamentals properly and will always be hobbled when it’s time to do something truly challenging that reaches all the way down to that foundation. I agree about starting with the fundamentals, but I think the 555 just doesn’t fit that role because it’s a rather complex circuit. Beginner tutorials involving the 555 don’t even attempt to talk about the principles of operation — it’s always “put this resistor here, connect that capacitor there”. In my opinion building various circuits from scratch is an order of magnitude more useful. The 555 can wait until the student is comfortable enough with the basics. Yet it isn’t -really- all that complicated. It’s just the same problem of treating ICs as black boxes, because the people who are trying to teach you didn’t bother to learn the fundamentals either. Most of the 555 circuits become trivially obvious once you actually take a look at the block diagram of what’s going on inside. A 555 is basically a set-reset latch where the set input has a logic treshold at 2/3 the Vcc, and the reset input at 1/3 Vcc. You can change these limits by inserting a voltage into the control pin. The rest is up to your imagination. I’ve seen a 555 plus passives and power transistor or relay being used to charge lead acids with solar panels. The 555 is a bunch of handy components stuck together in a common fashion, that’s the secret sauce. >I’ve seen a 555 plus passives and power transistor or relay being used to charge lead acids with solar panels. I would rather use a TL7702 power supply supervisor for that. It has built-in reference source (which the 555 lacks) and larger input voltage range 3.5 – 18V. The 555’s upper limit of 16V just doesn’t leave much margins for working with lead acid battery. That’s again a matter of preference. The TL7702 has a fixed voltage reference, which can easily be added to the 555 circuit if needed, and since the 555 doesn’t have fixed thresholds, you can do more stuff like temperature-dependent charging cut-off points by adjusting the control pin with a thermistor. And, it seems to me that the TL7702 doesn’t do hysteresis, so it’s not really suited for charging applications where there’s a significant difference between the charging and resting voltages of the battery. With a 555 you can use separate voltage dividers for the set and reset comparators, allowing you to independently set the levels where charge is triggered and cut off, and both can be separately or mutually temperature compensated, either by adding thermistors in the dividers, or to the control input pin. Besides, in a PbA battery charging application, you would first provide a stable operating voltage for the 555 with a regulator, so that the comparator reference levels would remain stable and at a useful range. You wouldn’t connect it to the battery directly. So, once regulated in this way, you don’t need the internal voltage reference. The voltage thresholds land at 2/3 and 1/3 of the regulated voltage, and you can use two trimpots to set the charge/cutoff points. The output doesn’t need to rise to the battery voltage level, because you’re most likely using a relay to switch the charging on and off. > there’s a significant difference between the charging and resting voltages of the battery. While you can change the Set threshold, the comparator 2 threshold is tied to 1/2 of the Set threshold. It is not accessible outside of the chip. Yes, you can add external parts to switch the divider chain etc. but that’s my next point. It is all about the amount of integration. You can even go overboard with adding extra parts. You got to ask yourself if there are other cleaner ways of doing it. Not really. A lead acid battery is similar to a LiPo. It requires CC charging as the battery voltage rise until it hits the float charge voltage and only at that point the voltage becomes constant. Essentially you have a fix voltage regulator with a current limit. The output voltage is limited by the current limit during CC stage and that the output voltage is below the voltage setting. If you share the control circuit with the power supply for charging, you cannot depend on your supply rail as a reference. Of course you can add a 2nd power supply, BUT that’s a sign of an inefficient designer. Are you sure you understood the idea? A 5 Volt regulator for the 555 deals with the voltage instability and allows you to switch at predictable points. You wouldn’t want to run your control circuitry off of an unregulated source anyhow, as it can cause all sorts of glitches. The point was that you don’t need a high voltage chip because you need to regulate anyhow. >I used a 3rd resistor tied to the open drain /Reset pin to make a programmable hysteresis. Yes, it’s always possible to make hysteresis by a feedback loop, but “programmable” is not “adjustable”, and not flexible. It would be very difficult to make your circuit adjust both the charge and cut-off points independently by temperature, or to trim their values afterwards. Why would you let a PbA battery deep discharge like that before charging it? That’ll destroy the battery. So your thresholds should actually follow two slightly different functions over temperature, which isn’t easily accomplished by simple feedback hysteresis, but is easily accomplished with a 555 because it has two independent comparators. Also, why are we still using thick film resistors? They have been around since the ’60s… And don’t get me started on copper wires. Nowadays, we should only rely on using hydrogen sulfide for conducting electricity. We’d be saving so much energy by reducing losses in our wiring! My comment was hyperbole or reductio ad absurdum. I’m saying that just because something has been around for a long time and there might be newer alternatives, that does not necessarily make the “old” tech obsolete. Instead, there can be uses for both, even in new designs. And electrons! Those things have been in use since before electronics even had a name! When do you get to the part where you recommend a BETTER part, which is ‘better’ because it’s ‘newer’. Here’s a clue for you: there is no better, newer part. That’s why it’s still recommended, and used. You’ll never get a job working on the world’s fastest supercomputers; just simply forget that. Here, in 2018, they are STILL programmed in FORTRAN, which was created in 1953, and made its first formal debut in 1957. But then again, perhaps every one of the supercomputer architects have NOT considered your valid argument that there’s GOT to be something better, simply because FORTRAN is so OLD. I find this type thinking absolutely incomprehensible. I remember when the 555 was new. It got publicity, but so did many other ICs. It was a time of growth, companies wanting that next successful IC. Some were intriguing, some were successful. Others seemed to have potential, but didn’t last long. The Norton amplifier came along in the LM3900, seemed to have great potential, but too.much trouble, so instead op-amps got better. The LM3909 came along complete with a large datasheet full of uses, and while it lasted a long time, never saw the use that one would expect from the launch. Companies released ICs hoping they’d get use, only to wither, a bad guess. Others had too limited use. Lots of radio-related ICs, few lasted long, and not even the ones for consumer radios. And yet, a simple AM radio IC, the ZN414 and its descendents, has been around for 45 years, neat toys for hobbyists, but I never saw much commercial use, except in recent times. The less defined the IC, the more use for it. The 555 was refined, a CMOS version that never won over. There were quad variants, the 557 and 558, same principle but fewer pins, hence not as versatile. Walter Jung’ IC Timer Cookbook came fairly early, and included some fancier IC timers, but who remembers their nunbers? The mistake may be that tubes went through iterations, so why would an IC last fifty years? But they improved dramatically, and got smaller. By the seventies, one wasn’t limping behind, so if an IC had use, no sense messing with it. Too bad that the CMOS version never caught on. Chip that old are made in older fabs on much larger geometry. The cost per chip can be much cheaper on smaller geometry. One day, they might be EOL. Eventually these fabs might get shutdown because they aren’t making much money or for maintenance reasons as it’ll get hard finding parts to maintain the fab. Chips were probably designed before modern day chip design tools, but 555 is simple enough to be redesign from scratch. Is it true the CMOS ones didn’t catch on? Maybe the distributors keep them in stock just for me, but I doubt it. > Here’s a clue for you: there is no better, newer part. That’s why it’s still recommended, and used. Have you heard about these futuristic things called microcontrollers? Please build an adjustable level schmitt-trigger out of an 8-pin microcontroller, that isn’t ridiculously slow and imprecise, and noisy. The 555 has a big advantage: it works without software. So are resistors, caps and diodes but we still use them. Creativity favors open-ended designs that can be a sandbox for development, and the 555 has been delivering that for over half a century now with no sign of slowing down. The original Apple II joystick interface is a 556 dual timer. Joystick X and Y pots vary pulse widths, which are timed by software. Both iconic works of hardware genius. In most PC sound/gameport cards it is a 558 (the quad version). While I haven’t actually *used* a 555 timer chip pretty much ever, I can really respect the open ended design. Now everyone’s in a race to remove features, make stripped down versions of things, and create closed ecosystems. I prefer the PIC and the Attiny, because a lot of 555 projects can make pretty good use of the added capabilities (Do you really want a blinking light, or would you prefer three fast blinks with a long space? Microcontrollers give you that choice). I wouldn’t suggest a 555 to anyone who’s doing electronics as a means to some other goal, like creating practical tools or making art pieces, although they have some real uses that an Attiny can’t do as easily. For “pure” electronics (In the sense of pure mathematics or pure chemistry), where you are just exploring the possibilities of a certain circuit design, it’s fantastic. People do so much with these little chips. A 555 is often useful as logic glue or analog “pre-processor” for the microcontroller, because its internal comparators can be used in many ways other than just blinking a light, and its fast because it’s so simple. Interesting that you would not suggest a 555… How about a live, modern example? We currently manufacture and sell stir plates with a speed controller based on a 555 timer. Sure, we could build these with a ‘better’ PIC. I’m a PIC developer and actually designed an equivalent controller around a 8 pin PIC and when it was done the circuit cost about a dollar more each plus we would have to invest time into programming the PICs in production. The end result would have been higher manufacturing cost. At an increase of $5.00 in material and labor per stir plate times the 3500 or so we’ve built to date, the increased cost is about $17,500! I just looked up 555 timers on Digikey and 411 items, including dual and quad variants returned against that query. The 555 timer is alive and well, and it’s not going away any time soon! There’s a good reason for this. The right solution is often the lowest cost reliable solution for the job and sometimes the answer is a 555 timer. Just because the part is older than you are does not mean it should be over looked in product design. Another point about the 555 is, that since it’s not programmed it cannot crash when it gets too cold or too hot, or from radiation, or corrupt itself from old age, or from EMI, a weak battery… it’s robust. Flash roms have data retention times around 10 – 20 years – an analog chip will just keep chugging along. Unless you were shooting for some ridiculously low frequencies with the 555, why would you use an electrolytic? There isn’t any inside the chip itself. Remember that 555 isn’t just for generating waveforms. It can be used for other things like time delays. Datasheet say that the upper limit of R is about 5M, so if you need a longer delay than 5 seconds or so, you would need a cap larger than 1uF. The time delay for the heating element in my food saver would be one place that this kind of delay is needed. If someone want to make a toaster using a 555 as a variable timer (instead of old school bimetallic switch), they would need long delays too. My toaster used something like a CD4060, CMOS but still software-free. And it did not die from broken electrolytics, but from an intermittent ground connection of the heating element. That let the low voltage tap (used to supplie the electronics) rise up to mains voltage. Generating a long time delay using an electrolytic capacitor isn’t a good idea, because electrolytics leak a lot and their properties change over time, so your time base won’t be accurate or predictable. If you want long delays, you’d use a ceramic/polymer capacitor and some flip-flops or decade counters to subdivide the pulse train you’re generating. You divide by half and half and half again, and that 5 seconds turns to 10, 20,40,80, 160…. etc. According to my father (the 555 designer) the failure of the competing product that came out about the same time, which he swore was stolen from them, failed not because of the 555 success, but the stolen design was based on the 9-pin original design he did. No-one wanted to us a 10 pin package when an 8 pin package was available. Could’ve been done with a 555.